Some procedures may help you escape the need for glasses. Monovision LASIK and lens replacement surgery may help you see more clearly. You cannot avoid declining vision. After age 40, everyone begins to experience some form of presbyopia, a condition coined from the Greek words for "old sight." As your eyes age, the lenses inside them naturally harden and lose their flexibility, which makes them less able to focus light directly onto the retina. This in effect makes it more difficult to see up close or even far away, which is why you need reading glasses or bifocals. 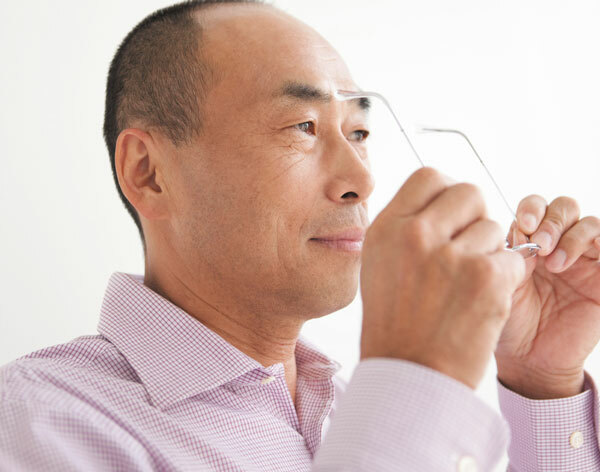 Presbyopia tends to worsen over the years. You may find you have to update your glasses to stronger and stronger prescriptions. Yet it may be possible to eliminate the need for glasses. "There are some surgical procedures that can correct fading eyesight and help men lose their dependence on eyewear," says Dr. Kathryn Hatch, an ophthalmologist with Harvard Medical School. "This can give men greater independence to live a more active lifestyle and can be quite liberating, especially for those who have worn glasses for decades of their lives." When you think of corrective eye surgery, LASIK (laser-assisted in situ keratomileusis) comes to mind. The popular procedure uses a laser to reshape the cornea (the transparent front cover of the eye) so it works better with the eye's lens to focus incoming light onto the retina. Although traditional LASIK cannot change the effects of an aging lens, some people can benefit from a procedure called monovision LASIK. With monovision, only the more dominant eye is corrected through LASIK surgery. This allows one eye to see up close and one to see far away, and together they can sharpen your vision at both distances. However, monovision LASIK has its drawbacks. It may not offer the same clarity as reading glasses, and it might reduce your depth perception. "This is why doctors often first fit patients with monovision contact lenses to see how they tolerate it," says Dr. Hatch. A bonus to trying this test: "If they are comfortable wearing contact lenses, they do not need the corrective surgery," says Dr. Hatch. There are also two variations on the contact lens approach: mini-monovision and modified monovision. With mini-monovision, used for people who don't do regular close-up work or reading, the lens in the less-dominant eye is weaker than optimal for distance vision. With modified monovision, a single-vision contact lens is worn for the distance eye and a bifocal contact lens for the up-close eye. All men over 60 should get an annual eye exam, according to the American Optometric Association. Besides checking your vision, the doc-tor can look for eye problems and diseases, such as age-related macular degeneration, cataracts, glaucoma, dry eye, and retinal detachment. Regular eye exams are also essential for people who suffer from high blood pressure or diabetes or who have had eye surgery. Monofocal fixed-focus lenses provide clear vision at one of three levels of adjustment—distance, intermediate, or near focus—depending on your specific need. Multifocal lenses help you see at multiple distances. Accommodating lenses, a type of monofocal lens, flex like a natural lens to provide a continuous range of focus. LRS is often used to treat cataracts, a condition in which the eye's lens becomes cloudy with age. If you do not have cataracts, the procedure prevents them, since your natural lens is replaced with a synthetic implant that never clouds up. LRS works likes this: the eye surgeon numbs the eye and then uses a laser to make precise incisions in the cornea. Next, he or she makes a circular opening in the capsule containing the lens. The surgeon then uses the laser to break the lens into small segments and removes those with an ultrasonic probe. Finally, the surgeon implants the new replacement lens into the capsule. The outpatient procedure takes about 15 to 20 minutes per eye, and eyes are often treated about two weeks apart. Patients see immediately after the surgery, and their eyes feel normal after about a day. LRS may not be appropriate for people who are only nearsighted or who have worn glasses most of their adult lives, says Dr. Hatch. The reason: a nearsighted eye has a thinner and more delicate retina, which can more easily tear or become detached during or after surgery. It is important to keep in mind that both monovision LASIK and LRS and are considered elective procedures and are usually not covered by most medical insurance plans. Talk with your doctor about your options. If you feel burdened by glasses, these procedures can help you see your life in a whole new way.